If your goods are worth storing they are worth insuring. 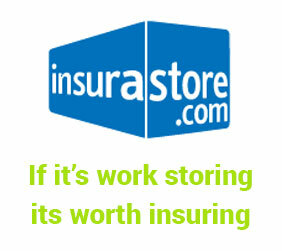 Many household policies include cover for temporary storage, but if yours doesn’t we can recommend Insurastore.com. We will ask you to evidence your insurance cover, so please check you policy or contact insurastore, charges from as little as 69p per £1,000 of cover. You can amend your self storage policies up and down as your needs and circumstances change. Cover can be instant, or start at a date in the future when your possessions go into storage. You can manage your policy entirely through the Website, adjusting the period, sum insured and specified items to suit your needs. Our insurance premiums cost just 69p per week for every £1000 worth of cover you require and you only pay for what you need with the right to cancel your cover at any time without notice. (Minimum policy length 28 days). Our self storage insurance policies are tailored to the needs of self-storage customers, so there’s no chance of paying for cover you don’t need. Their website encrypts all credit and debit card transactions, and your security online is our priority.